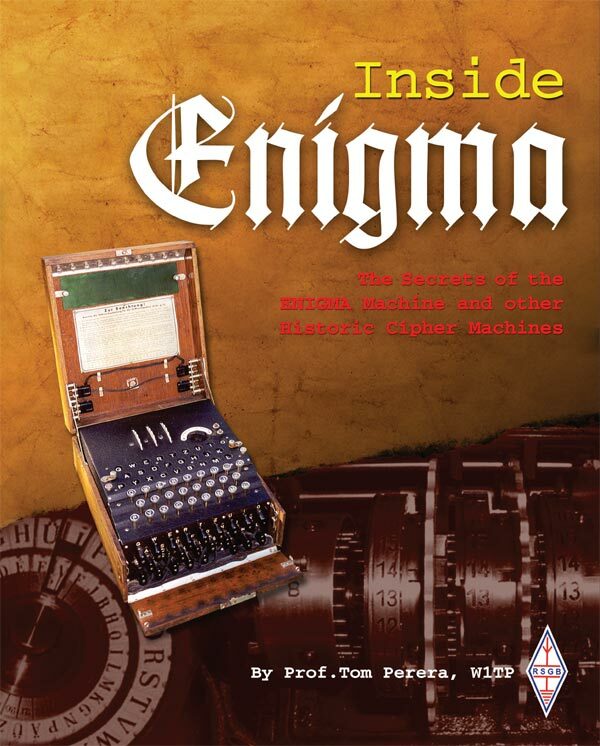 "INSIDE ENIGMA" by Tom Perera; published in 2011. New information about cipher machines is constantly coming to light as historic government archives are declassified and studied by historians. This information as well as corrections and revisions will be added to this page as often as required. If you have any corrections, suggestions, additions or can supply photographs and/or additonal information to make future editions of my book and Enigma Library CD-ROM better and more accurate, please email us using the address at the bottom of this page. Thanks. REMINDER: On 27 June, 2009, I published the 4th. edition of the CD-ROM entitled: "The Story of the ENIGMA: History, Technology and Deciphering" It is the most complete source of information on the Enigma in a single publication. It contains twice the material in the 3rd edition and includes a complete History, Thousands of Photographs, Books, Wiring Diagrams, Enigma Simulator Programs, Videos, Information on the Russian cipher machine FIALKA and many others. Click above for more information. FRODE WEIERUD'S name is misspelled in the Acknowledgements section on page 3. Frode has made truly extensive contributions to our knowledge of the history of the Enigmma and I deeply regret this error. A rather extraordinary Enigma replica has been built by Gurt, PA3GUF. The www.w1tp.com/enigma museum has acquired a WW-2 German Navy 4 rotor Enigma Cipher Machine that was thrown into a German lake where it has rested underwater for 65 years. The Enigma has been carefully inspected and photographed and an autopsy has been performed to try to reconstruct the details of it's death. Please visit: http://EnigmaMuseum.com/euw1.htm for details and photographs. Many thanks to Jerry McCarthy of Wokingham, U.K. Page 4 and elsewhere: “Weirud”. Should be “Weierud”. Page 16 and elsewhere: “Gluhlampenmaschine”. Would be better with the proper two dots over the "u". Page 16 and elsewhere: “Zahlwerk”. Would be better with the proper two dots over the "a". Page 17 and elsewhere: “Funkschlussel”. Would be better with the proper two dots over the "u"
Z u r B e a c h t u n g ! 1. Zur Säuberung der Walzenkontakte alle Walzen mehrmals gegenseitig vor- und rückwärts drehen. 1. To clean the rotor contacts, turn all rotors against each other back and forth several times. 2. To clean the key contacts, press each key down hard and allow it to come up quickly, while holding another key continuously pressed. 3. Make sure by checking in the windows that the rotors are correctly inserted. 4. Die unverwechselbaren doppelpoligen Stecker sind bis zum Anschlag in ihre Buchsenpaare einzuführen. Die vordere Holzklappe ist danach zu schließen, da sonst 3 Lampen zugleich aufleuchten können. 4. The double-pole plugs are to be pushed to a firm stop into the double sockets. Then, the front wood flap is to be closed; if this is not done, 3 lamps can light up at the same time. 5. Leuchtet bei Tastendruck keine Lampe auf, so sind die Batterie, ihre Kontaktfedern, ihre Anschlüsse am Umschalter und der Umschalter zu prüfen. 5. If no lamp lights up with a keystroke, then check the battery, the lamp contacts, their connections, and the key-switches. From machine No. A 4388 onwards, the opening on the right side of the lamp panel can be used for lamp examination. Von Maschine Nr. A 4388 ab dienen zur Kabelprüfung die äußerste linke und rechte Buchse der mittleren Reihe am Steckerbrett und die Kabelprüflampe auf der linken Lampenfeldseite. From machine No. A 4388 onwards, the outermost left and right sockets of the middle row of the plugboard together with the cable test lamp on the left side of the lamp panel can be used for cable testing. 7. Walzenachse und Walzenbuchsen sind sauber zu halten und wie alle übrigen Lagerstellen hin und wieder mit harz-und säurefreiem Öl leicht einzufetten. Die festen Kontakte der Walzen sind alle 6.8 Wochen mit Polierpapier über zu schleifen und mit einem wenig getränkten Öllappen abzureiben. Die Tastenkontakte, die Lampenkontakte und die Kurzschlußbleche sind vor Öl zu schützen. 7. Rotor axle and rotor sockets are to be kept clean and be lightly greased every so often with acid-free oil. The fixed contacts of the rotors are to be cleaned every 6 to 8 weeks with polishing paper and are to be rubbed with a rag, lightly soaked with oil. The key contacts, the lamp contacts and the shorting bars of the plugboard are to be protected against oil. 8. Key-setting is done using either numbers or letters. Page 20 and perhaps elsewhere: “HEIL”. Should be “HELL”. Page 23: “Detailed Path of the Voltage from Battery to Bulb” – a step is missing. The original text for each line is shown first. This is followed by the corrected text for that line preceded with the word "Corrected". 1. Battery -4v. An internal 4 volt battery or an external DC source. 2. Keyboard key contacts. The normally open contacts are closed when a key is pressed. This passes the voltage along the appropriate letter’s wire to the input disk or input connector. 2. Keyboard key contacts. The normally open contacts are closed when a key is pressed. This passes the voltage along the appropriate letter’s wire to the plugboard. 3. Input disk or input connector. The input disk carries the voltage into the right hand end of the set of three rotors and the reflector. 3. Plugboard. If no plug is inserted in the socket in the plugboard, an internal shorting bar simply passes the voltage directly to that key’s connection on the input disk or input connector. If a plug is inserted into the socket in the keyboard, the plug carries the voltage over to some other socket and from there to a different keyboard key’s connection on the input disk or input connector. 4. Rotors. 3 (rightmost), 2 (middle) and 1 (leftmost). The voltage enters the rightmost rotor (3) from the input disk or input connector and travels left through its wiring to the middle rotor (2), then left through its wiring to the leftmost rotor (1) where it travels left through this rotor’s wiring to the reflector. 4. Input disk or input connector. The input disk carries the voltage into the right hand end of the set of three rotors and the reflector. 5. Reflector. The reflector receives the voltage from the leftmost rotor (1) and its internal wiring sends the voltage back out along a different wire. 5. Rotors. 3 (rightmost), 2 (middle) and 1 (leftmost). The voltage enters the rightmost rotor (3) from the input disk or input connector and travels left through its wiring to the middle rotor (2), then left through its wiring to the leftmost rotor (1) where it travels left through this rotor’s wiring to the reflector. 6. Rotors again. 1 (leftmost), 2 (middle) and 3 (rightmost). The voltage enters the leftmost rotor (1) from the reflector and travels right through its writing to the middle rotor (2), then right through its wiring to the rightmost rotor (3) where it travels right through this rotor’s wiring to the input disk or input connector. 6. Reflector. The reflector receives the voltage from the leftmost rotor (1) and its internal wiring sends the voltage back out along a different wire. 7. Input disk or input connector. The input disk or input connector receives the voltage from the rightmost rotor (3) and carries it to the plugboard. 7. Rotors again. 1 (leftmost), 2 (middle) and 3 (rightmost). The voltage enters the leftmost rotor (1) from the reflector and travels right through its writing to the middle rotor (2), then right through its wiring to the rightmost rotor (3) where it travels right through this rotor’s wiring to the input disk or input connector. 8. Plugboard. If no plug is inserted in the socket in the plugboard, an internal shorting bar simply passes the voltage out to the keyboard’s normally closed contacts. If a plug is inserted into the socket in the keyboard, the plug carries the voltage over to some other socket and from there to a different keyboard key’s normally-closed contacts. 8. Input disk or input connector again. The input disk or input connector receives the voltage from the rightmost rotor (3) and carries it to the plugboard. 9. Keyboard switches again. The normally-closed contacts on the keyboard pass the voltage directly along to the appropriate light bulb. 9. Plugboard again. If no plug is inserted in the socket in the plugboard, an internal shorting bar simply passes the voltage out to the keyboard’s normally closed contacts. If a plug is inserted into the socket in the keyboard, the plug carries the voltage over to some other socket and from there to a different keyboard key’s normally-closed contacts. 10. Light bulbs. When a specific light bulb is illuminated, it lights up a single letter on the light panel. 10. Keyboard switches again. The normally-closed contacts on the keyboard pass the voltage directly along to the appropriate light bulb. 11. Light bulbs. When a specific light bulb is illuminated, it lights up a single letter on the light panel. Page 27: Picture top right has caption: “Calbovocorressi”. Should be “Calvocorressi”. Page 31: Paragraph beginning “Illustrated on the left”. Should be “Illustrated below”. Page 52: “Durchmesser” means “Diameter”, and doesn’t therefore refer to the height. The picture on Page 48 shows that the bulb is overall (glass plus metal thread part) roughly 21mm long, 12 mm in diameter, and the glass part is around 6mm high. Page 55/56 and elsewhere: “Grossdeutchland” should be “Grossdeutschland”. Page 64/67 and elsewhere: Polish accents missing. “Rozycki” would be better as: “Rózycki" with the proper accent over the "o” and the proper dot over the "z". Page 70. 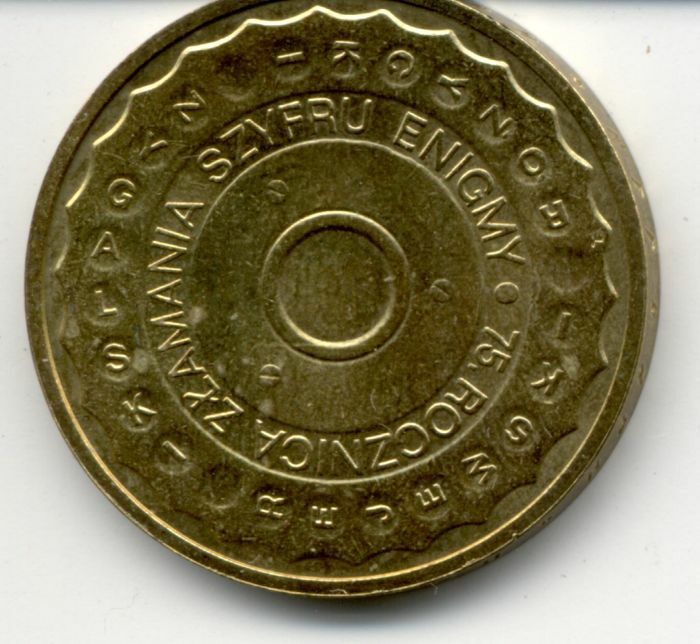 There is now a Polish Commemorative Enigma coin available. Jerry McCarthy has provided me with images of the front and back of the coin as well as English tranlations of the inscriptions. 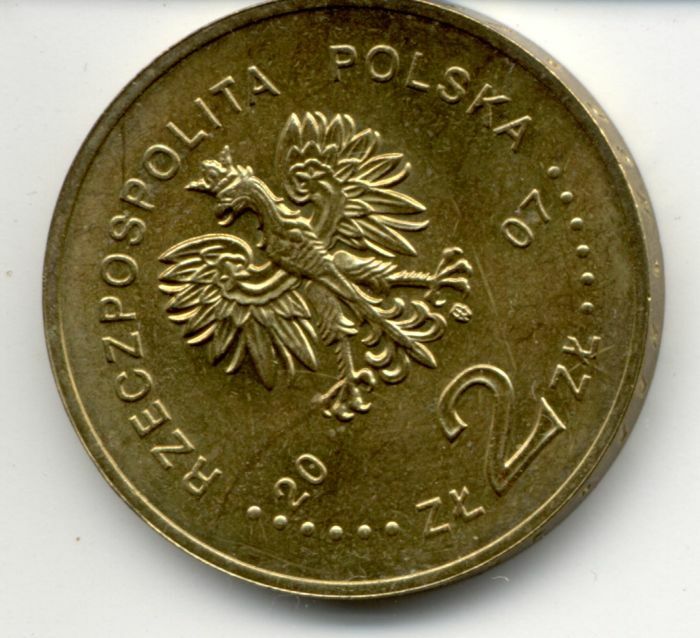 He tells me that this is the two Zloty coin and other denominations exist. The first side reads: "Rzeczpospolita Polska", which translates as "Republic of Poland"
The second side reads: "75 rocznica zlamania szyfru Enigmy" which translates as "75th anniversary of breaking the Enigma cypher". Also on this side are the names "Rejweski","Rózycki" , and "Zygalski". (with the proper Polish accents over the O and z in Rozycki's name. Page 75 and elsewhere: “Donitz” would be better as “Doenitz” or “Dönitz” with the proper two dots over the "o". STRICTLY KEEP MILITARY AND STATE SECRETS ! Page 107. Jerry McCarthy has provided the information below about the Japanese characters on the light-panel. • Kanji (the full, “ornate” Chinese characters). • syllables can also be single vowels. 1) other consonants are possible, by applying “accents” to the characters in the table below. However, the Japanese crypto machine in question seems not to use any of these extended characters. 2) Some consonants are pronounced differently from what might be expected, depending on the following vowel; such variant characters are marked with a superscript number, which is explained in the second table. and “Shinkansen” could be . In practice, neither word is spelled like this in real life; these examples are intended merely to show the operation of the syllabic system. For this machine, it seems that the 25 characters appear on the light panel and 50 characters appear as two characters per key on the main keyboard; the functionality of the two keys to the left of the main keyboard is to act as shift keys, selecting between the two sets of 25 characters on the main keyboard. It is assumed that the shift keys also slide a transparency in the light panel, thereby allowing all 50 characters to be displayed. The spelling of Hitler's first name should be Adolf. This section could benefit from a discussion of "Double-Stepping". Enigma K was not exclusively Swiss. H & R supplied the Swiss with a number of then-current commercial Enigmas which by that time had changed their numbering prefix letter from "A" to "K". They were subsequently modified [as on these pages] and rewired by the Swiss. The rotors labeled as being from Hitler's headquarters were mislabeled by the museum. They are actually a pair of Zusatzwalzen from a marine M4 Enigma. The museum has since replaced them with a set that is more appropriate to the label. Inside Enigma; first printing; page 152; Sample Rotor Advancing Data for all Ten Rotors for the first Twenty Letters Typed etc. The table is correct. The explanation below it is correct up to point 8, where the text deviates from what the table shows correctly. Note that for the 5th letter, the table shows that rotors 2,4 and 6 turn, where the explanation claims that rotors 6, 8 and 10 do not. 8. Remember: rotor advance blocking pins prevent the even numbered rotors to the right from turning. Now, type in another letter. The drive cog turns the drive rotor "2" at position 14 where there is NO rotor advance blocking pin. Without a rotor advance blocking pin in place, rotor "4" is also rotated and turns to position 30. This means that the drive cog effective FOR THE NEXT LETTER will turn it at position 17. Because all the wheels that turn, turn together, for the current letter the drive cog for rotor "4" still effectively turns it at position 18. Since the table shows that rotor "4" has no drive blocking pin in position 18, this allows rotor "6" to turn to position 30 as well. Rotor "6" does has a drive advance blocking pin at position 18 which blocks the next rotor "8" from turning. Like rotor "4", rotor "6" turns one step and the drive advancing cog effective for the next letter will turn them at position 17. The detailed wiring table showing the rotor wiring for all models of the Enigma was omitted from the Enigma book. It will be included in the next edition. 1. Page 35, top right, last sentence, starting with “Also,. . .,” I think this is a sentence fragment. 3. Page 59, left column, I was not able to print-out the Miller book The Cryptographic Mathematics of Enigma using this web address. It may be better to email or write for a copy: 4. Page 69, picture caption, the last column, “Kenngruppen,” is not “ . . . the letters to appear in the windows for each rotor (The Starting Position or Groundsetting).” Each 3-letter Kenngruppen group is combined with two random letters to make-up a 5-letter group at the beginning of a Wehrmacht message. The receiver of the message used the 3-letter Kengruppen embedded in the 5-letter group to verify that the message was authentic for that date. Note: This may affect some of the information on pages 69-71. Please send us any other corrections or additions so that we can make this page and future editions as complete as possible. Professor Emeritus Thomas B. Perera Ph. D.
Although all the pictures and text in these internet pages are copyrighted, you may use any of them for your own personal applications including public lectures and demonstrations, publications and websites as long as you mention the www.w1tp.com/enigma Museum. If you plan to offer them for sale to the public in any form, you must email me for permission which I will generally grant as long as you mention my museum: http://w1tp.com/enigma. My email address is given at the bottom of this page. Some of the material may require contacting other copyright owners for commercial use and I will inform you by email. Please also see the disclaimer of warranty.